On Saturday morning, members of the Bakken Pipeline Resistance Coalition returned to the Norton’s Ford put-in site along the Des Moines River in Boone County to embark on a flotilla protest against the Dakota Access pipeline that now pumps crude oil under the river just north of the County Highway E18 bridge. Last June, when the coalition first organized a flotilla, construction crews had not yet pulled the pipeline under the river — efforts to stop it continued through the fall — and protesters still hoped to halt the project. Saturday’s plans, then, may have seemed like a bittersweet reprise, now that the pipeline has been operational since the first of the month. 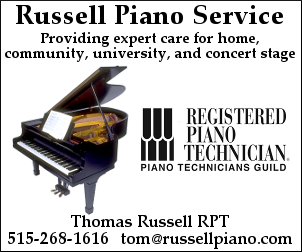 Instead, with news that a federal district court ruled in favor of North Dakota’s Standing Rock Sioux Tribe that the Army Corps of Engineers conducted an inadequate environmental review for the project, the second flotilla became an opportunity to celebrate a fight that has not yet been entirely lost. Ed Fallon, the director of the environmental group Bold Iowa (and whose gubernatorial campaign I volunteered on a decade ago before becoming a journalist), reminded coalition members of another protest July 1 outside the state Capitol in Des Moines targeting the IUB, saying part of its focus would be on pressuring Gov. Kim Reynolds to replace Richard Lozier on the board. Lozier, former Gov. Terry Branstad’s latest appointee to the board, has recused himself from any decisions on the Dakota Access pipeline because of his recent work as legal counsel for the pro-pipeline front group Midwest Alliance for Infrastructure Now. 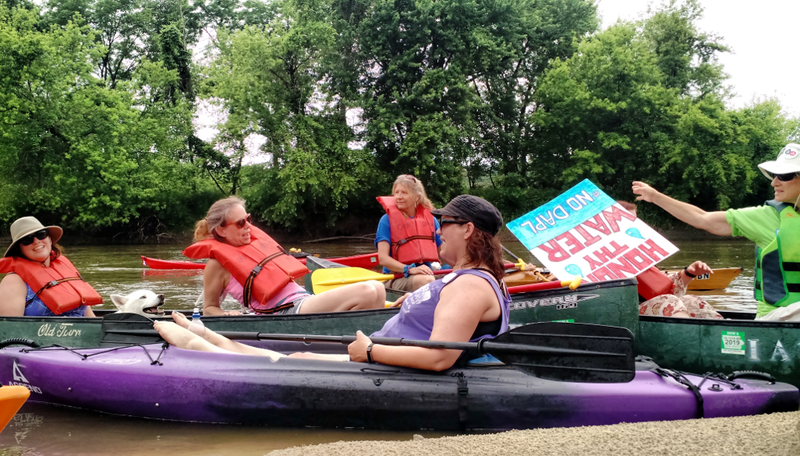 After a tranquil four-and-a-half-mile journey down the river, under the E18 bridge and onward to the take-out site at the North Fraser ramp, coalition members, as they did last year, departed to a community center in Pilot Mound for a potluck and discussion. 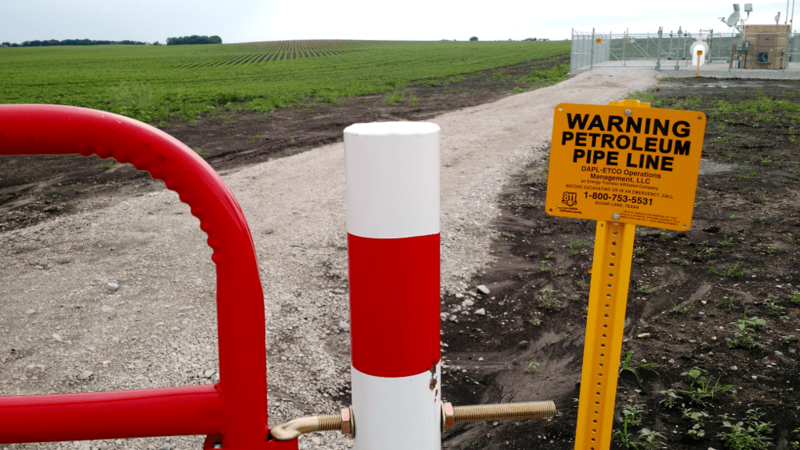 Along the way, men in vehicles with out-of-state license plates — possibly with the private security firm TigerSwan — observed protesters near the pipeline’s route, which was visible in nearby fields by the red easement gates and patches of dirt where no crops had taken root. At the community center, Angie Carter, a founding member of the pipeline resistance coalition who is leaving the state soon for a job in Michigan, recounted the pipeline protest movement’s efforts in Iowa since the project was first announced in the summer of 2014. Those efforts included dozens of direct actions at which protesters risked arrest, petition drives targeting Branstad and the local office of the Army Corps near Des Moines, an alliance with the Standing Rock Sioux Tribe, and another flotilla last summer along the South Skunk River across which the pipeline now also flows.